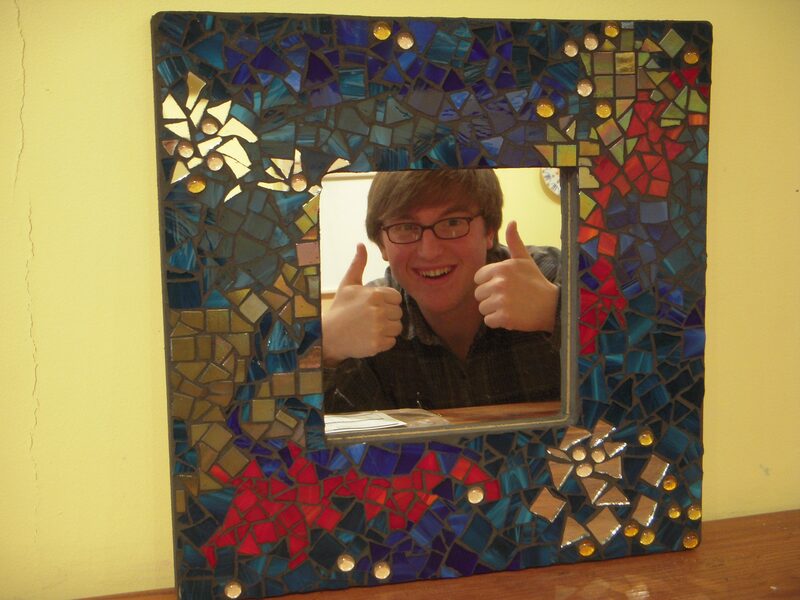 Making a mosaics is a really FUN creative art medium. We have beautiful samples in the store for inspiration and books to help along the way. We have animals, picture frames, mirrors, tables, boxes and more. If there is something you want to mosaic, but don’t see it in our store, please ask a staff person and we can special order what you are looking for. Below is just a small list of some of the bases we have. The following are price ranges of some of the mosaic we have. Mosaic prices include a take home grout kit. We also have or can order coat racks, trivets, plaques, boxes and letters. Just ask a staff person if you are looking for anything in particular. 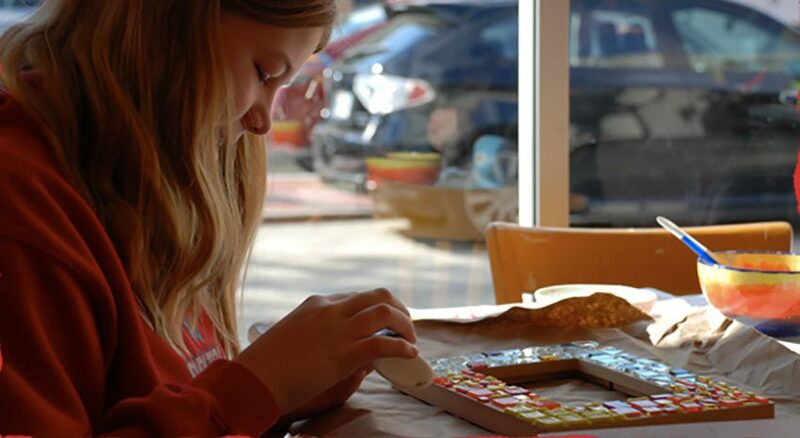 Ages 5 and up can participate in making a mosaic with the assistance of their parents. You don’t need any prior experience, just open to trying. Choose the base you want to mosaic, we have a great selection. Then you would take a container (we use muffin tins) and fill with any color mosaic glass you like.Also, you are welcome to bring in shells, coins or a broken piece of china which can be broken up more to be incorporated into your mosaic piece. Bring to your table a bottle of glue and tools, like tile cutters. Arrange the tiles on your base and glue down, leaving a little bit of space in between each tile. You need room for the grout, so avoid having the glass touch each other. 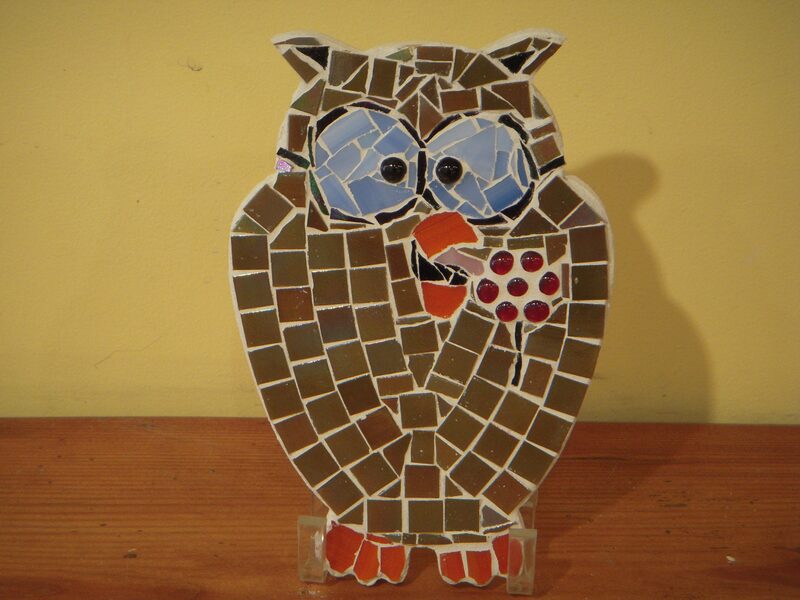 Once your finished gluing all the glass you can leave the completed piece for us to grout OR we will give you a take home instruction kits to finish at home. If you grout at home, you need to wait at least 24 hours for the glue/tiles to set before you grout. A photo mosaic is another option. 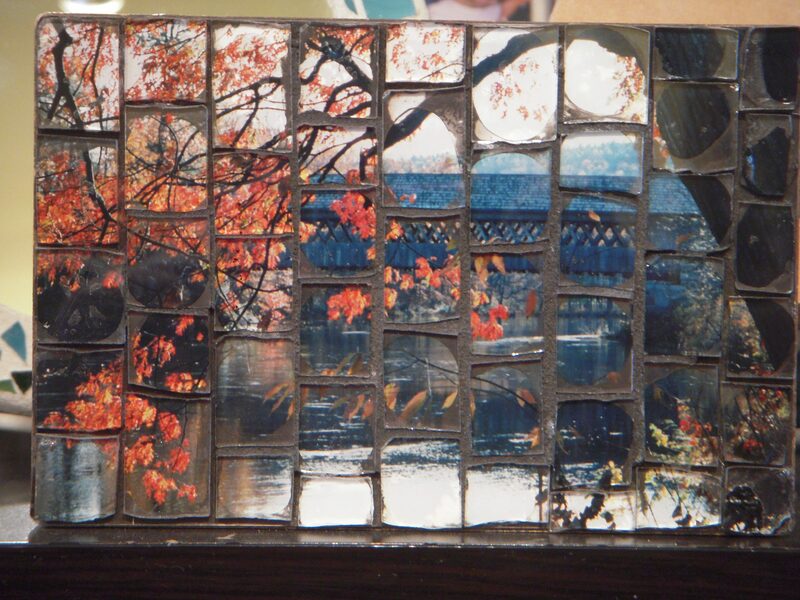 You glue down clear tiles on top of a fabulous photo which you bring to the store. No cutting involved, just bring a photo, must be on photo paper, and let the gluing begin. In 24 hours your piece will be ready for grouting. Allow adhesive to set for 24-48 hours. Add small amounts of water until you get a smooth peanut butter or toothpaste consistency. Apply grout on top of design. Push grout into small spaces with your fingers or craft stick. Let mixture set for about 5-10 minutes, then wipe excess off with slightly damp sponge or cloth. Continue until all grout is removed from each tile. Once dry, polish piece with soft cloth. DO NOT put excess grout down the sink!! Warning: contains portland cement. Wear rubber gloves and eye protection. Avoid eye contact or prolonged skin contact. Wash thoroughly after handling. If eye contact occurs, flush with water for 15 minutes.